Optimist Clubs sometimes struggle with how to best reach students with programs. Even the oratorical and essay scholarship contests often fall behind other schoolwork that children have to do. 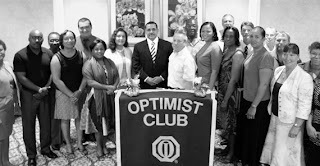 The Optimist Club of Grand Cayman has a top-down approach to getting participants. They recently held a joint meeting for all school administrators and sought their buy-in for Optimist Club programs. The technology theme should feel contemporary to students and encourage them to think critically about the way they act when online. Past club president Dunbar McFarlane completed his presentation to the school adminstrators by quoting from the Optimist Creed and encouraging a positive attitude for all. 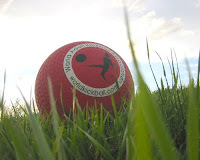 Recently, the Sandusky County Board of Developmental Disabilities sponsored a Kick It for Children's Cancer Research kickball contest and the Optimist Club of the Fremont Area, Ohio was there to participate by sponsoring a kickball team. According to Optimist Club team member Wynn Shell, participating was more than just fundraisng for him and several othe rmembers for they are cancer survivors. Others have family members or friends who have suffered the challenges of cancer treatment. Kick it for Children's Cancer is a national nonprofit organization that benefits pediatric cancer research. Money raised through this program is donated to the Children's Tumor Foundation and CureSearch, to fund research at the Children's Oncology Group (COG) and to Flashes of Hope, a mission to provide free portraits to children with cancer. Optimist International also funds pediatric cancer research through John Hopkins University with the Childhood Cancer Campaign. ALEXANDRIA participated in the National Hunting and fishing Day by cooking Hot Dogs for lunch. ATHENS had their 28th annual Optimist Volley Ball Classic with teams from 12 schools. BIRMINGHAM palticipated with Our Lady of Lourdes Labor Day Festival and they will receive some funds for their Cards for Kids project. BIRMINGHAM WEST END had a NOW program and got five new members and were able to end the year increasing membership by five. BOSSIER CITY presented their Respect For Law Award to City Marshall Johnny Wyatt for his outstanding job with internet safety. HUNTSVILLE reported that Jim Roe and his committee completed the HEALS Clinic painting project. MOBILE MID TOWN had a Officer of the Month program recognizing a local hero of the community. PERDIDO BAY had avery successful 23rd annual Mullet Festival during the Labor Day Holiday. This is their biggest fundraising event. TALLADEGA completed the 2008-09 Optimist year being Distinguished, a'first in the life of the club. Kudos to District Bulletin editor and District S/T Harold Stratz for sharing the accomplishments of clubs in your district. In Palm Springs, California, the Palm Desert Optimist Club celebrates exceptional students and exceptional school staff members every month at a breakfast. This month six students, one certified staff member and one classified staff member from Palm Desert High School received honors. Honorees were senior Cameron Curtis, senior Yolanda Velazquez, junior Ryan Clark, junior Antonia Gutierrez, sophomore Mykolas Marcinkevicius, sophomore Morgan Levy, freshman Daniel Rolph, freshman Kate Mook, certified staff member Karen Logan and classified staff member Thressa Williams. This is a simple way to get the club's name out in front of your schools so that when it is time to hold scholarship contests and encourage student participation in community service activities they are already aware of the purposes of the Optimist Club and familiar with its members. Plus it's a great way to say thanks to some hard working people for making a positive difference every day. When I heard about an Optimist Club program that serves at least 14,000 children each year, I had to find out more! A quick click took me to the Optimist Club of Oakville, Ontario, Canada where I learned all about the Halton Region Police Children's Safety Village. This small-scale town was first created in 1987, but in 1993 the Optimist Club adopted the village as a pet project. They renovated and restored the construction to make it safe and attractive. With their ongoing support in maintenance and repairs other resources are freed up so that police officers can provide both indoor and outdoor safety lessons for children in kindergarten through third grade. They learn to be safe with electricity, bicycle and pedestrian safety, school bus safety and rules of the road. For their service, the Optimist Club of Oakville has been granted a meeting room in the basement of one of the buildings at Safety Village. The 7th District Optimist Club of Bushwood, Maryland has a signature event that puts them on the map as a tourist destination. The event also serves as their major fund raiser. What is it? The Annual Blessing of the Fleet. The Annual Blessing of the Fleet is a two-day family affair that takes plase at the ST. Clement's Island Museum Grounds, Coltons Point, Maryland. There are historical tours around town, to St. Clement's Island and the Blackstone Lighthouse. There are petting zoos and reptile exhibits. There are magic shows, native dancing, fireworks, and all of the food and entertainment of a usual family festival. But most important, and the reason for the event, is the Blessing of the Fleet on October 1 as the oyster harvesting season begins in Maryland. The 7th District Optimist Club decided to organize the event at the suggestion of Father John J. Madigan and the activity has been continually celebrated for 40 years. More than 5,000 people attend each year. Find out more at the 7th District Optimist Club website. According to an article in the Peoria Journal Star, the Optimist Club of Chillicothe, Illinois is going into the entertainment industry. 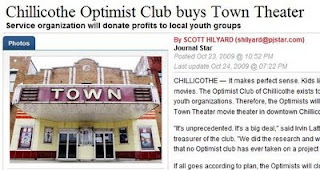 Utilizing tax increment financing assistance and matching those funds with fundraising efforts, the Optimist Club has purchased the Town Theater in downtown Chillicothe. They plan to operate as a nonprofit corporation with a six-member board of directors and four employees. Net profits will benefit local youth serving organizations including the Optimist Club, little league sports and Boy and Girl Scouts. The theater was sold to the Optimist Club for $200,000. A local realtor waived commissions on the sale in order to save the club money and with a down payment of $20,000 the club was in the entertainment business. The mayor was a bit reserved at a service organization holding such a major interest in the downtown core, but has warmed to the idea with the plans for renovation and growth. I think this is exactly what an Optimist Club is supposed to do for their community. Congratulations to the Optimist Club for being part of the economic development efforts in Chillicothe, Illinois. Here is another ritual that communities of every size have come to rely on their local service clubs to carry out: the Halloween Parade. In Pottstown, Pennsylvania, it is the Optimist Club that ensures children have a safe and fun trick-or-treating experience. This year the Pottstown Optimist Club Halloween Parade took place on October 21. The masquerade was illuminated by the spotlights from firetrucks; and a hearse playing Michael Jackson's Thriller led the way for revelers of all ages - both two and four legged - as they marched through town towards the costume judging contest. Marching bands and floats completed the parade entries and candy was handed out to all. The city's official trick-or-treating time is scheduled for October 31 between 6:00 and 8:00 p.m.
View a photo album of Halloween in Pottstown here. This project makes me feel a little nostalgic because small town rituals were the beginning of my involvement as a volunteer for Optimist Clubs. When I read that the Optimist Club of Baldwinsville, New York would be painting windows in the storefronts of their downtown community I was reminded of crisp autumn evenings and parents who worked too many hours at our family owned appliance store. But the reason for my post is not to indulge in my memory, but rather to say how awesome! The Baldwinsville Optimist Club has bought up all the paint in town and on this Saturday they will take interested artistic students with them to paint Halloween scenes on storefront windows. Ghoulish masterpieces will add to the charm of the town and the enchantment of All Hallow's Eve. But what this project really does is give lasting memories to those involved in painting and those involved in admiring their artwork. Thanks for sharing your paint, your creativity and yourselves with the Baldwinsville community. See the full article at cnylink.com. Coupons, free food and a chance to win prizes during the Super Bowl. All of this can be yours when you purchase a Football Playoff Book from the Optimist Club of Spearfish, SD. According to the sales pitch, the book will make a great gift or stocking stuffer, but the story behind the pitch is what the Optimist Club does every year for the community thanks to the generous purchases at this one time of year. The Spearfish Optimist Club holds only two fundraisers each year, the Football Playoff Books and a Home Show. They raise about $30,000 that is returned to the community in the form of youth programs, student of the month recognition and grants and scholarship awards. Fifty-two organizations other than the Optimist Club are beneficiaries of this clubs fundraising efforts. They also accept grant requests from individuals and clubs seeking to fulfill their needs. You can find a grant request application here. Optimist Clubs fulfill needs in their local communities. The Spearfish Optimist Club has found their niche in fundraising and grantmaking. Thank you for serving your community. "The Optimist Club will accept nominations from individuals who identify and explain how they would spend $1,000 to help a Caroline individual or family this Christmas. The nomination would go into detail as to how the money would be spent and how receiving the gift the individual or family would enjoy a special Christmas. The Optimist Club will select the best project and then meet with the person submitting the nomination to make the “wish come true” for the individual or family mentioned in the nomination. Only Caroline County residents can receive the gift, but nominations can be received from anyone. Nominations should be made to assist an individual or family with special circumstances that $1,000 would make a difference in their holiday season. The funds will be spent fulfilling that “Christmas wish” that under ordinary circumstances the individual or family would not obtain it. Deadline for nominations is Monday, November 23 and the winning nomination will be notified on Wednesday, December 9. Nominations must be submitted in writing and the proposed recipient clearly identified. Please submit nominations with name, address, phone number and/or e-mail address to: Optimist Club of Caroline County, % President Cindy Ashcraft, 17173 Camellia Drive, Ruther Glen, VA 22546." It may only be October, but it sounds like it is time to start making plans for your Optimist Club holiday activities. The Optimist Club of Bixby, Oklahoma received a $500 grant from the Optimist International Foundation for a start-up program aimed at reducing drug and alcohol abuse and smoking in teens. On October 30, they will roll out the second phase of their "No Poison" awareness program during the Bixby High School football game. Here's how it works: every student who brings in a t-shirt or cap that advertises a nicotine or alcohol product will receive a new t-shirt or cap that says no to drugs, alcohol and tobacco. The shirts and caps will be handed out as long as they last. In the first phase of the program teens participated in a sticker party by placing stickers on cases of beer at a local market. The sticker reminded the clerk and the consumer to check for identification and not to sell to minors. What an interesting way to engage with the students. Way to go Bixby Optimists. The Canadian township of Delhi, Ontario is home to approximately 16,000 residents and a four-year-old Optimist Club dedicated to fulfilling the needs of their community. So far they have created sports leagues and events that had never existed before like tee-ball and soccer. The sports activities help children develop skills and inspire a love for the game and have brought families together at sporting events. Seeing how successful the sports activities were, the club decided to branch out into a little more: free movie nights and arts and crafts days in the park. Using funds raised from their concession sales, they brought Shakespeare in the Park to town and invited children to attend movies on rainy days. Now the Wyndham Centre Optimist Club wants to do even more. They have invited the community to participate in goal setting and will soon release a new set of objectives to help them fulfill their mission of building a better community for families. All of our Optimist Clubs share this mission. I wonder how many have invited the stakeholders to be involved in planning? It's a great idea; try it! Technology is making it so much easier to share information. 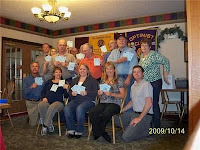 I was excited to see that I had a Flickr alert for new Optimist Club pictures. I was doubly excited to see that the picture set was about the Optimist Club of Victoria, British Columbia; my home district. Great pictures: please take a look. But here's the challenge of ubiquitous technology. I grabbed the link. I enjoyed the pictures of my Optimist friends, but at the end of the photo set, I was confused. I had no idea who the people in the pictures were or what the cause was they donated to. Yes, I could see that it went to Jenecee Place and I could event tell that Jenecee Place was the organization that posted the photos. However, I still don't know why or who the young lady was that collected the donation. So I have a tip for you today. When you set out to tell a story in pictures, please be sure to provide captions. Your viewers will appreciate it. Northcentral Technical College in Wausau, Wisconsin is home to a new Optimist Club this year. The Breaking Boundaries Optimist Club is made up of foreign exchange students who plan to take the Optimist Club mission with them when they return to their native countries. Among the members is Luis Navarro from El Salvador. He hopes to start a food pantry and help the homeless through his church. Melvin Rivas hopes to share a positive message against drug abuse when he returns to Honduras. But while they are in the United States, the group will conduct educational events at libraries and community gatherings to talk about their cultures and explain their customs. According to Romey Wagner, a member of the Noon Optimist Club of Wausau, he encouraged the students to come together as a college Optimist Club with the hope that they would start service groups when they return home. They will follow each other online when they return home to keep up their momentum. They will also be fund raising while in the US so that they have resources to begin their efforts in their native lands. But what happens to the club when they return home? Part of their mission will be to recruit and inspire new exchange students into thier club so that it remains a cultural aspect of the college. Photo courtesy of the Breaking Boundaries Optimist Club. Students don't usually participate in cross country racing events until they reach middle or high school, but in Georgetown, Ontario the Optimist Club sponsors an annual cross country meet for elementary school students. Students from 8 to 13 participated in the two-day running meet with awards being given for individual merit and team performance. Joseph Gibbons Public School was the all-around winner on the first day of competition and Stewarttown Middle School dominated on the second day. The friendly competition encourages good sportsmanship, physical activity and team and individual accomplishment. About 500 students participated in Georgetown Optimist Club's Annual Cross Country meet this year. Photo courtesy of the Georgetown Optimist Club. More and more civic organizations are coming together to raise funds and awareness for local causes. The latest one brought to my attention was the Chili Cook-off Challenge in Conway, Arkansas to benefit ArtsFest. In its third year, ArtsFest is a community festival to celebrate local arts and artists. This year it included free musical performances, dance companies, an art and music walk and independent film premiers. There was also a traveling education program on loan from the ArtsFest in Pittsburg, PA and of course, the chili cook-off challenge. All events were held October 7, 2009. The chili cook-off challenge was coordinated by they Conway Noon Rotary Club. Answering the call to action were teams from the Conway Optimist Club, Kiwanis, Lions, Sunshine Optimist Club of Conway and the Conway Morning Rotary. It's all about fun and community according to the challenge spokesperson Becky Harris and we agree. But what we really want to know is if one of those Optimist Clubs emerged with bragging rights this year to the best chili in town. Please post any updates in the comments below! Many children are looking forward to trick-or-treating in a few short weeks, but in Rochester, Michigan, they are also looking forward to the Bloomer Boogie. What is the Bloomer Boogie? It is a 5k walk/run in Bloomer Park, Rochester Hills, MI that is held annually by the Rochester Area Optimist Club. There are categories and prizes for all ages including a Boo Boo Fun Run for the littlest competitors. This year's event will take place on November 1.What a great way to walk off the candy the day after Halloween! I've heard of local haunts and favorite haunts to describe places where people often gather; but this is the first time I have ever heard of a charity haunt, and what a haunt it is! Terror on the Fox is the haunted house attraction coordinated annually by the Optimist Club Green Bay-Preble, Wisconsin. The Optimist Club has been involved with the charity haunt for thirteen years and it has become the club's biggest fundraiser. According to club member Chris Boland people don't quickly realize that the haunted house is an Optimist Club activity; however, Optimist Club members plan year-round for the event and approximately 60 volunteers work behind the scenes while the event is open. The Bad Boys Scenic Design creative group has been retained to make the house fresh, new and scary each year and it's the newness keeps people coming back. They also offer special days for reduced and sometimes free admission and this year plan to be especially aware of the economic conditions of many families. Last year, Terror on the Fox attracted more than 20,000 visitors and cleared more than $26,000. The funds are distributed to local youth organizations and allow the Optimist Club to conduct their programs annually. They are also welcome to new members and new ideas for service projects in the community. They also receive help from the Phoenix Optimist Club, a college club associated witih the University of Wisconsin-Green Bay. Terror on the Fox is open now through October 31. Take a look at the schedule and make arrangements to be scared today. I love the internet. It allows people from different communities, divergent views, and alternate opinions to write on various topics simultaneously and often without ever being seen by one another. Except for me - when it comes to seeing what has been published about Optimist Clubs, I'm pretty observant. That is why this particular headline "Optimist Club prays for activism" caught my attention. First, Optimist Clubs are generally non-denominational and open enough to understand that not all people choose prayer in their lives. But the real issue here is praying for activism? Isn't that usually synonymous with dissent, protest or social change? Wow, that's a pretty powerful headline. I'd better find out more. Imagine my surprise when I clicked on the link and found out that the article was simply a story about the Optimist Club of Scotland, North Carolina's installation banquet. So perhaps whoever led the blessing of the meal prayed for an active club or possibly the Optimist District governor challenged them to change, but I don't think they were promoting activism; at least not in the usual sense of the word. My caution today. You may not always be able to edit what is written about your Optimist Club so make sure your words express your true meaning. The Optimist Club of Barbados recently undertook a huge clean-up program. In order to get it done, they enlisted the help of the Lions and other service clubs in the community. What was it ? Beach clean-up! It takes a lot of care to make an island that attracts so many tourists liveable. Tourists come and go giving a somewhat transient feel to the community. But the service clubs know different. They know that it takes their ongoing service to improve the quality of life in their community. Thanks so much to the Barbados Clean Team and the Barbados Optimist Club. You truly make a difference. Dennis Voy, an on-air personality with KMAQ radio in Maquoketa, Iowa recently shared his enthusiasm for the Optimist Club. He gave a shout out to the new president Rick Henshaw and new secretary/treasurer Lois Fischer. According to Dennis's Daily Report they will do a good job, but you can find out for yourself by joining the Optimist Club of Maquoketa for a big breakfast. They meet every Wednesday at the Eagle's Club. Dennis's report was peppered with friendliness and familiarity. He knows most of the members personally and has memories of eating carmel apples made by the Optimist Club when he was a young boy made by the parents of the current members. That's advertising that you can't buy. Thanks Dennis; you embody the spirit of optimism. I hope they consider you for an honorary spokesperson of the year award. Between 400 and 500 children participate in free after school programs sponsored by the Optimist Club of Summit County, Colorado. They play volleyball and chess; participate in scholarship contests for speaking and essay writing, and are given internships at local businesses to help them make good career choices. This Optimist Club is doing exactly what every Optimist Club strives to do. But as the Summit County Optimist Club has found out, it takes more than money to keep these programs going. It takes volunteers. Their main fundraisers - a golf tournament and ski pass raffle - generate approximately $15,000 each year. According to the club secretary, revenues were down a little this year, but the club can still cover its obligations and even help children do a little bit more. The real challenge according to treasurer Bill Wallace is finding the people to mentor, supervise or just be available for the kids. This is a universal challenge of course. We're busy. We donate money, not time. We hope that others will join the cause first. All service clubs hear similar excuses, but the bottom line is that the children need you! They need us - caring adults - to make a difference in their lives every day. Please don't make excuses. Join an Optimist Club today. Photo submitted by the Dillon Lake Summit County Optimist Club. To find an Optimist Club near you, please click here. This is a picture that you don't see a lot of in the Optimist Club world. Not that Optimist Clubs don't give away money; trust me, they do! However, Optimist Clubs are especially known for their hands-on activities in the community, especially with programs that benefit children and pictures most frequently include kids. In this picture, the Optimist Club of Princeton, Illinois decided to support a local soccer program. The $1,000 check will allow the coaches who are already in place to reach more kids by covering fees and purchasing needed equipment. It was a great way to serve more kids without reinventing the wheel. Boys and girls get to show off their football skills during annual Punt, Pass & Kick Competitions throughout the United States. Many Optimist Clubs sponsor the competetion because it fits nicely with the Tri-Star Sports programs aimed at teaching basic skills to students in baseball, football and soccer. Shown here are two contestants in McCook, Nebraska. The Optimist Club partners with Weiland Field and the NFL for the competition. Meet Camdenton Optimist Club members Chic Oostendorp and Brenda Coulter. They are on a mission to give away 250 dictionaries; one to every student in the fourth grade in the Camdenton School District. This picture shows them handing out dictionaries to students at Hawthorn Elementary. Another community; another day of caring organized again by the United Way. This time the United Way challenged the Van Wert, Ohio communiity to collect 25,000 canned goods. Thanks to the donations from the Van Wert Rotary and Optimist Clubs, they met their goal. The service clubs contributed 12,278 non-perishable food items. The balance came from the business community with the total reaching 25,807. This is yet another example of how sharing service can be fun. Get your community involved in a Day of Caring or maybe a Day of Optimism. Call it what you want, just make sure everyone is invited to participate. The Optimist Club of Akron, Ohio recently honored Summit County sheriff's deputy Mark Carroll for his work in community policing. Deputy Carroll has been with the force since 1991 and began community policing efforts in 2006. Among his achievements is the Senior Watch Program whereby deputies make regular contact with seniors who live alone to ensure their safety. One hundred and twenty residents are part of the program. Kudos to Deputy Carroll for his dedication and congratulations for your award. One of the purposes of Optimist International is to promote respect for law; another is to promote safety. This is program that does both. I hope the Optimist Club gets involved with the good neighbor calls! Thursday is free admission day . . . with a donation to the Tucson Optimists Children’s Cancer Fund. What a great way to generate awareness and raise money for the Optimist International Childhood Cancer Campaign. A big thank-you to the organizers of the event for sharing their revenue with the Optimist Clubs in Tucson. The event is this weekend October 1 - 4 at Hi-Corbett Field, 3400 E. Camino Campestre Tucson, AZ. I have been sharing Optimist Club stories one project at a time; but since it is the beginning of a new year, I thought perhaps you would like to get a feel of what a successful year of programs sound like. The following was written by Alastair Stone, the retiring president from the Summit Lake Optimist Club of Dillon, CO.
Stone published this thank you letter in the Summit Daily News. I think you can see how Optimist Clubs engage people from all walks of life. Membership and involvement can make a difference in your life. Think about it. Join an Optimist club today. Please click on the letter to enlarge. Happy New Optimist Club Year! October 1 marks the fresh start of the Optimist International administrative year. Optimist Clubs around the world install new officers and plan for the next year of service to their communities. As we move forward, we say thank you to our retiring Optimist International President Don Sievers and welcome to our new President Mark O. Shriver, IV. Optimist Clubs share a mission and vision of providing hope and positive vision to bring out the best in children. Each year the new president chooses an theme to motivate the clubs and members to action. President Shriver has chosen an eagle to symbolize reaching for the best and with a promise to yourself to share your optimism...for the kids.